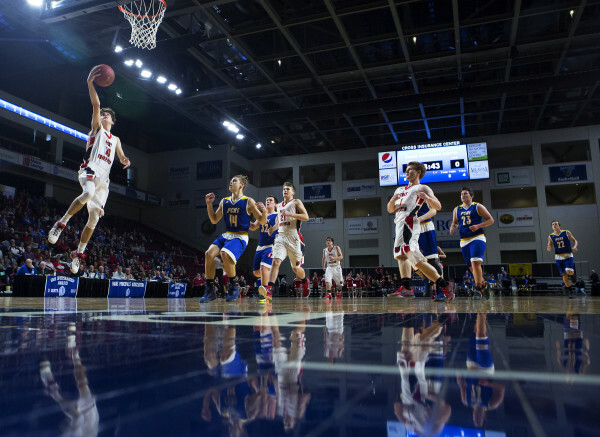 Fort Fairfield's Christopher Giberson (right) fades a shot past Piscataquis' Damyan True during their Class C boys basketball quarterfinal game at the Cross Insurance Center in Bangor Tuesday. 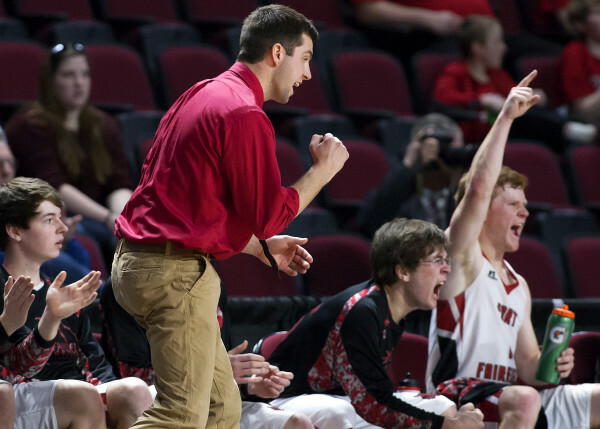 Fort Fairfield head coach Logan McLaughlin (center) celebrates after his team scored against Piscataquis during their Class C boys basketball quarterfinal game at the Cross Insurance Center in Bangor Tuesday. 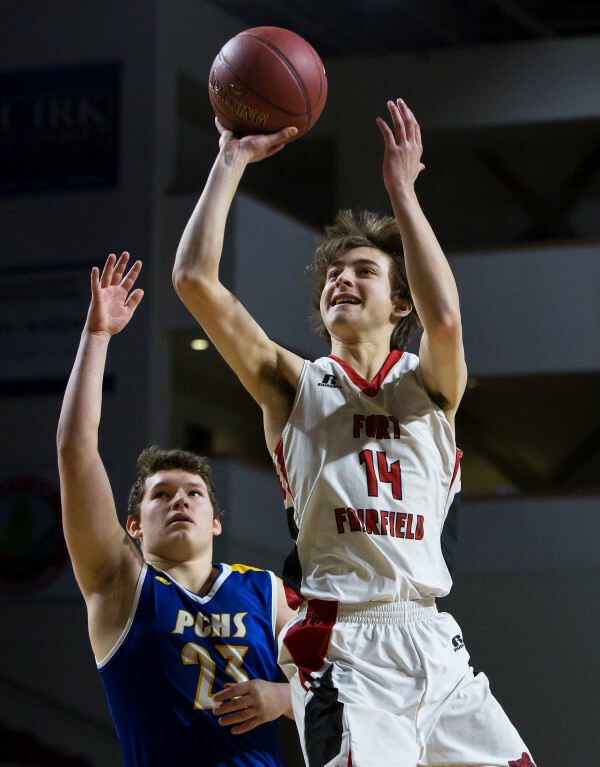 Fort Fairfield's Isaac Cyr (left) goes up for a layup past Piscataquis' Dillon Drew during their Class C boys basketball quarterfinal game at the Cross Insurance Center in Bangor Tuesday. BANGOR, Maine — Basketball is often a game of scoring runs, and Tuesday’s Class C North quarterfinal between No. 2 Fort Fairfield and No. 7 Piscataquis Community High School was no exception. Fort Fairfield scored the first 11 points in Tuesday’s contest and led by 10 at the end of the first quarter and all signs seemed to be pointing to a Tiger rout over PCHS. But then the Pirates of Guilford went on a run of their own, outscoring Fort Fairfield 12-4 to start the second period and the once sizeable Tiger lead was cut to two points in a matter of minutes. The Tigers (18-1) regained their composure to go up 29-20 at the half and used a balanced scoring attack in the second half to regain control of the game and sail past No. 7 PCHS 66-43 Tuesday afternoon at the Cross Insurance Center. Fort Fairfield advances to Friday’s 2:05 p.m. semifinal, where it faces No. 6 Schenck of East Millinocket (15-5), which beat No. 3 Hodgdon 65-46 earlier Tuesday. Isaac Cyr led the Tigers with 19 points, while Chris Giberson chipped in 16 and Ryan Player added 11. For PCHS, Bryce Gilbert led the way with 17 points and Dillon Drew added nine. 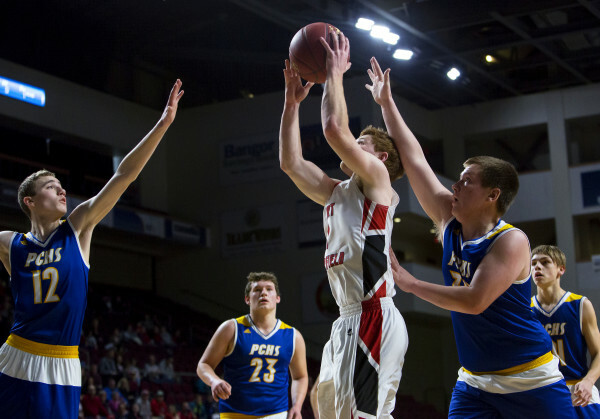 Last season, the Fort Fairfield boys basketball team came down to Bangor as the No. 2 seed in Class C only to be upset by Hodgdon, 45-38. So when the Tigers once again finished as the second seed in the Class C North region, McLaughlin was determined not to have a repeat performance. The coach said by sitting and watching the day’s first game between Hodgdon and Schenck, and the amount of intensity shown by those two squads, it served to fire up the Tigers for their quarterfinal.